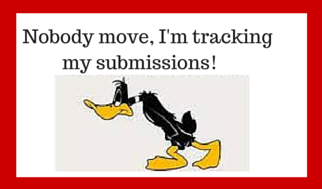 Now, that you’re thinking about submitting your work, you need an easy method for tracking all those submissions. Turn around time can vary from a few days to nearly a year. The average response time is more like 2-3 months. You need a record of who, where and what you submitted to avoid sending the same query to the same publication/editor. Keeps track of documents and word counts. We all have more than one version and/or word count and being able to identify the appropriate document is helpful as market guidelines may differ. And, builds your own statistics regarding response times, acceptance rates, or those offering feedback and critiques. Duotrope Digest – A huge searchable database, and due to the large membership, statistics are readily available. Information is entered manually. The cost – $5/month. The Writer’s Database: A free, online database which functions similar in fashion to Duotrope. Requires manual entries in a smaller database. Use folders on your computer. Arrange by time, publication, or title. Good labeling is the key to organizing your files. Or, use a spreadsheet, as I do and NOW, you can too. An easy and quick submission tracker at your fingertips. Header columns include: Title, Category/genre, Submission Date, Status, Publisher, Website, Reply/Comments and Document links. You can change them to suit your needs. Click the link or image to download your copy today. In Word, open the document. Select Document, then select File. Locate your file in the Finder, select and the link is automatically entered. Open File Properties and enter the link in the Summary Section under Hyperlink Base. I hope you will enjoy this gift and find it helpful in keeping track of your submissions. I’d love to hear from each of you and what you think about the tracker. Happy writing and success on your submissions.